This site is designed to list the locations of all the British military aircraft which are no longer in active service. We aim to provide details of their locations and status, and currently have images of many thousands of these aircraft. If you can provide details, or pictures of some of the missing frames, we will be pleased to hear from you. 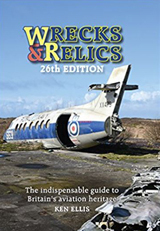 This site is not designed to compete with Wrecks and Relics by Ken Ellis, a publication which is wholeheartedly recommended. With its 26th edition published in 2018, this invaluable book is available at many outlets. This site ONLY lists aircraft with a military history. This site does not detail c/ns or aircraft histories. This site includes aircraft which are still flying, even though not in their original service capacity. This site details overseas locations where former British military aircraft can be found. This site contains a very large selection of photographs and aims to be updated on a regular basis. If you are able to assist us with any further updated information, you are welcome to get in touch with us by using our anonymous feedback form.